Craig Bailey, PhD, associate professor of history, reads his edifying and entertaining introduction to the Mill Creek Valley project website. The Aurelius Digital Scholarship Initiative at Falvey Memorial Library supports digital humanities projects and digital scholarship here at Villanova. Our digital humanities superheroes are Laura Bang, Digital and Special Collections curatorial assistant, and David Uspal, senior web specialist for Library Services and Scholarly Applications, and together they work with classes to produce fascinating and forward-thinking digital scholarship. Past classroom projects include the Ardmore Project, a digital edition of El Perú en sus tradiciones, an su historia, en su arte, Travels Through Greco – Roman Antiquity, and a series of DH workshops for graduate students covering topics such as coding basics, audio editing, and mapmaking. 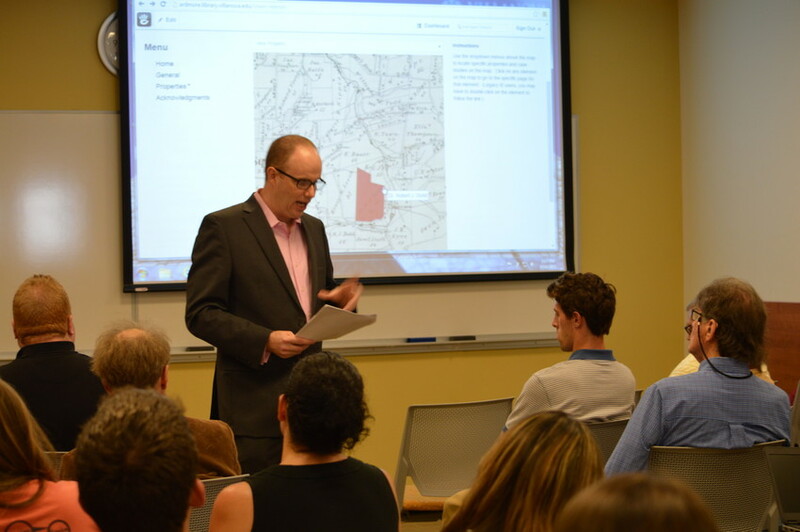 This past Monday, Bang and Uspal joined Craig Bailey, PhD, associate professor of history as he and his undergraduate class launched an interactive website tracing the transformation of the Mill Creek Valley. 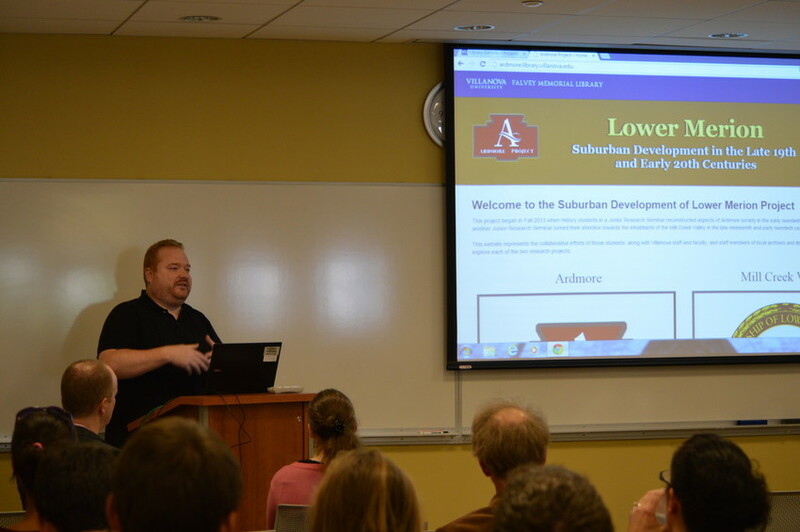 Dave Uspal explains the website building process and introduces the audience to the wonders of responsive resizing. 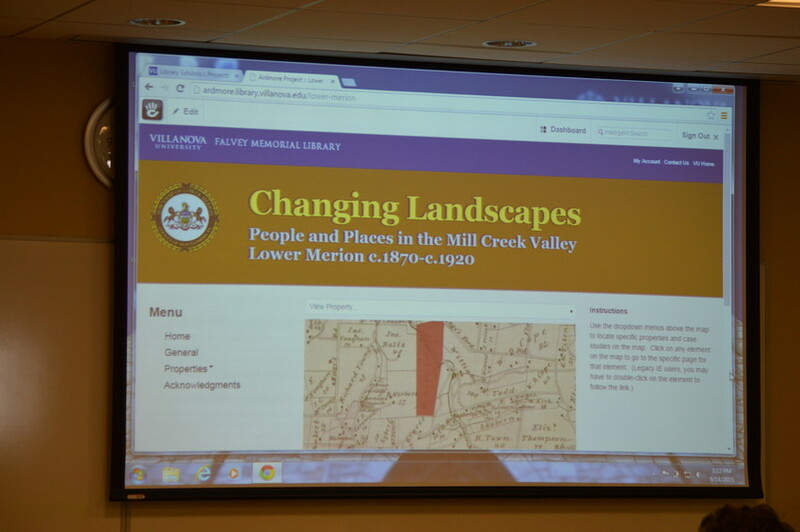 The launch took place at 3:00 p.m. in room 204 of Falvey Memorial Library, and Dr. Bailey presented a talk entitled “Changing Landscapes: People and Place in the Mill Creek Valley, Lower Merion c.1870-c.1920.” In spring 2015, ten junior-year students participating in a research seminar with the Department of History undertook a group project to examine how the farms and mills of the Mill Creek Valley transformed into the familiar residential properties of today. Each student chose a property from an atlas published in 1877, traced that property’s development over time, and reconstructed the lives of the inhabitants. Working alongside Digital Humanities staff in Falvey Memorial Library, students constructed an interactive website to communicate their research. The satisfying reveal of a finished product.